Michael Fowler Physics Department, UVa. The purpose of this lecture is just to review the various motions observed in the heavens in the simplest, most straightforward way. We shall ignore for the moment refinements like tiny deviations from simple motion, but return to them later. It is illuminating to see how these observed motions were understood in early times, and how we see them now. Of course, you know the Earth rotates and orbits around the Sun. However, I want you to be bilingual for this session: to be able to visualize also the ancient view of a fixed Earth, and rotating heavens, and be able to think from both points of view. Some of these topics are treated nicely in Theories of the World from Antiquity to the Copernican Revolution, by Michael J. Crowe, Dover. There is one star that always stays in the same place in the sky, as seen from Charlottesville (or anywhere else in the northern hemisphere). This is Polaris, the North Star. All the other stars move in circular paths around Polaris, with a period of 24 hours. This was understood in ancient times by taking the stars to be fixed to the inside surface of a large sphere, the "starry vault", which was the outer boundary of the Universe, and contained everything else. Of course, we only see the stars move around part of their circular path, because when the Sun comes up, the bright blue scattered Sunlight--the blue sky--drowns out the starlight. If there were no atmosphere, we would see the stars all the time, and see the complete circles for those that stayed above the horizon. Try to picture yourself inside this large, spherical rotating starry vault with stars attached, and visualize the paths of the stars as they wheel overhead. Think about the paths the stars would take as seen from the North Pole, from the Equator, and from Charlottesville. Every day the Sun rises in the east, moves through the southern part of the sky and sets in the west. If there were no atmosphere so that we could see Polaris all the time, would the Sun also be going in a circular path centered on Polaris? The answer is yes. (Well, almost). If you were at the North Pole in the middle of summer, lying on your back, you would see the Sun go around in a circle in the sky, anticlockwise. The circle would be centered on Polaris, which is directly overhead, except for the fact that you wouldn't see Polaris all summer, since it wouldn't be dark. Here of course we see the Sun circling part of the time, and see Polaris the other part of the time, so it isn't completely obvious that the Sun's circling Polaris. Does the Sun circle clockwise or anticlockwise for us? It depends on how you look at it--in winter, when it's low in the sky, we tend to look "from above", see the Sun rise in the east, move in a low path via the south towards the west, and that looks clockwise--unless you're lying on your back. Actually the Sun moves very slightly each day relative to the starry vault. This would be obvious if there were no atmosphere, so we could just watch it, but this can also be figured out, as the Greeks and before them the Babylonians did, by looking closely at the stars in the west just after sunset and seeing where the Sun fits into the pattern. It turns out that the Sun moves almost exactly one degree per day against the starry vault, so that after one year it's back where it started. This is no coincidence--no doubt this is why the Babylonians chose their angular unit as the degree (they also liked 60). Anyway, the Sun goes around in the circular path along with the starry vault, and at the same time slowly progresses along a path in the starry vault. This path is called the ecliptic. The motion of the Sun across the starry vault has been known at least since the Babylonians, and interpreted in many colorful ways. 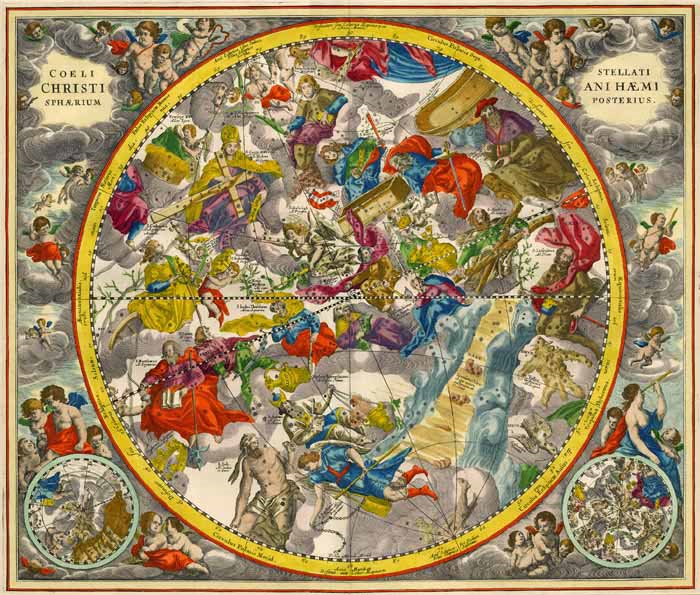 Compare our present view of the stars, thermonuclear reactions in the sky, with the ancient view (see Hemisphaerium Boreale, Appendix to Heath's Greek Astronomy). Many of the ancients believed, to varying degrees, that there were spirits in the heavens, and the arrangements of stars suggested animals, and some people. 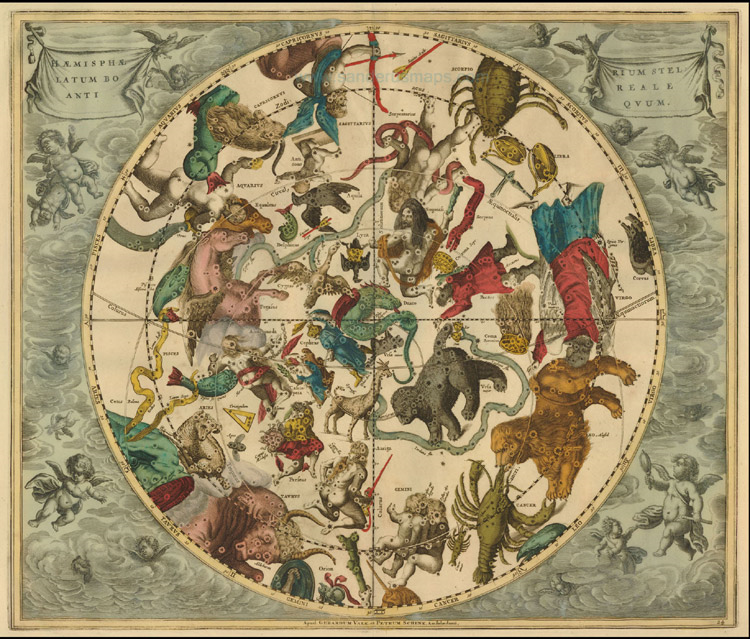 The Sun's path through all this, the ecliptic, endlessly repeated year after year, and the set of constellations (the word just means "group of stars") and the animals they represented became known as the Zodiac. ( " zo" being the same Greek word for animal that appears in "Zoo".) So this is your sign: where in its path through this zoo was the Sun on the day you were born? 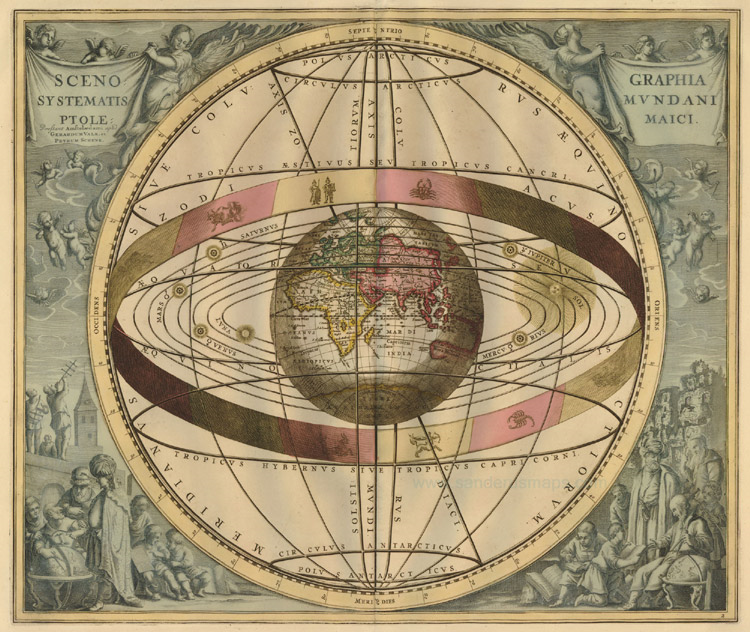 Notice that the print shows the Sun's path through the northern hemisphere, that is, for our summer. The furthest north (closest to Polaris) it gets is on June 21, when it is in Cancer, it is then overhead on the Tropic of Cancer, 23.5 degrees north of the Equator. In other words, the spherical Earth's surface is visualized as having the same center as the larger sphere of the starry vault, so when in its journey across this vault the Sun reaches the tropic of the vault, it will naturally be overhead at the corresponding point on the Earth's tropic which lies directly below the tropic on the vault. The Sun goes around the starry vault once a year, the Moon goes completely around every month. Does it follow the same path as the Sun? The answer is no, but it's close. It always stays within 5 degrees of the ecliptic, so it goes through the same set of constellations, "the Moon is in the Seventh House" and all that. 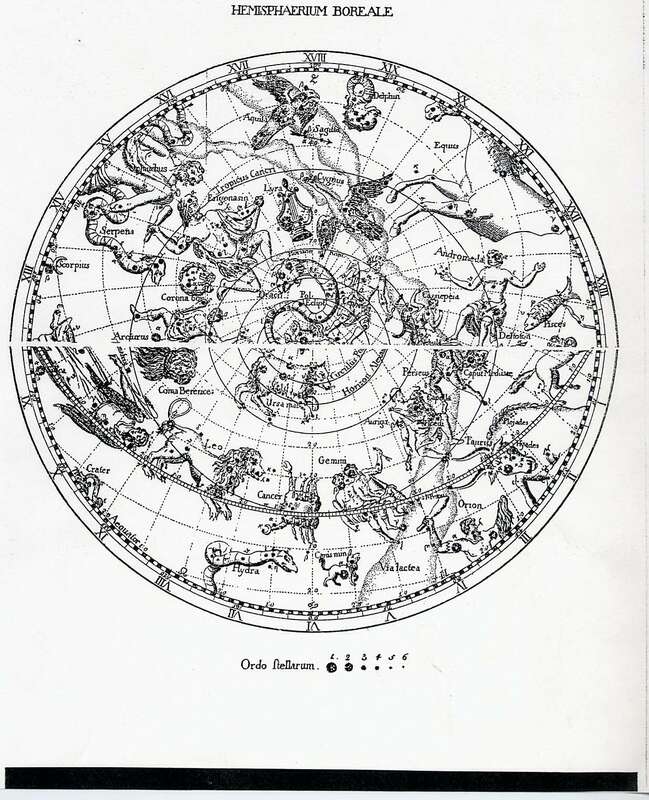 In fact, the "houses"--the signs of the Zodiac--are defined to occupy a band of the stars that stretches eight degrees either way from the ecliptic, because that turns out to be wide enough that the Sun, Moon and all the planets lie within it. How can we understand the Moon's motion from our present perspective? If the Earth, the Moon and the Sun were all in the same plane, in other words, if the moon's orbit was in the same plane as the Earth's orbit around the Sun, the Moon would follow the ecliptic. In fact, the Moon's orbit is tilted at 5 degrees to the Earth's orbit around the Sun. This also explains why eclipses of the Moon (and Sun) don't happen every month, which they would if everything was in the same plane. In fact, they only occur when the moon's path crosses the ecliptic, hence the name. Notice the band representing the zodiac. Since ancient times it has been known that five of the "stars" moved across the sky: Mercury, Venus, Mars, Jupiter and Saturn. They were termed "planets" which simply means wanderers. Are their paths in the starry vault also related to the ecliptic? The answer is yes. They all stay within 8 degrees of the ecliptic, and in fact this is the definition of the Zodiac: the band of sky within eight degrees of the ecliptic, and for this reason. Do they go all the way round? Yes they do, but Mercury never gets more than 28 degrees away from the Sun, and Venus never more than 46 degrees. Thus as the Sun travels around the ecliptic, these two swing backwards and forwards across the Sun. The other planets are not tethered to the Sun in the same way, but they also have some notable behavior--in particular, they occasionally loop backwards for a few weeks before resuming their steady motion.